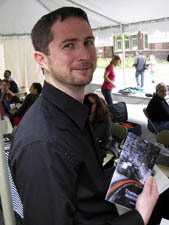 Ian Rogers Author Photo, courtesy of the author. Featuring one of Ian Rogers’ creepiest monsters from the Black Lands yet, Black Eyed Kids is definitely a book to evoke lingering chills that won’t leave your spine alone. The creepy effect of this book is multifaceted. Rogers presents the most terrifying monster of all – fear itself. Intangible, inescapable, immaterial; fear is impossible to fight against. Rogers creates a set of monsters that inspire irresistible fear that is so strong that those exposed to it invite their own death as an escape from the eternal darkness – invite the object that inspires their terror into their homes and asks it to take them into the oblivion of death (the only escape). Worse, the monsters who evoke that fear just by their presence, through some metaphysical act, take the appearance of children… and their only defining feature of difference is their black eyes. Good horror takes the familiar and makes it strange and embodies lingering fears, and this is certainly horror of the best kind. Rogers takes the image of innocence in our society, the child, and makes it something that evokes horror. He takes us into a realm of fear where even the most innocuous and normal thing can be an object of utter difference. And, he knows enough about fear to present his audience with the idea that sometimes people would rather die than live in continuing, ever-present fear. Fear of things is scary, but Fear itself is a terror that cannot be escaped from. In a society that desires its own innocence, where adults are reading teen fiction as a voyage back into the realm of nostalgia to a perceived better time that predated the horrors of adulthood, Rogers complicates things by corrupting that image of youth, by inverting it and projecting it as an embodiment innocence despoiled. The third book in the Felix Renn series, this one is perhaps the most terrifying of all, and one in which the author reveals that the true monster… is the author himself. He is the object that inspires our terror. I was able to get this book signed by Mr. Rogers and he added an extra level of terror by signing it with the words “Watch out for the BEKs”, making sure that I didn’t sleep for a week after reading it and paid attention to the eyes of any little people around me. This entry was posted in Fiction Book Reviews and tagged Burning Effigy Press, fear, horror, Ian Rogers, innocence, Monstrosity, reviews.